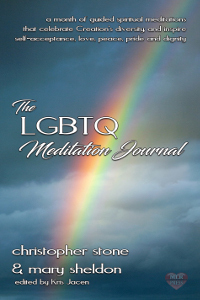 For the fourth in their highly successful series of guided meditations books, Christopher Stone and Mary Sheldon focus upon the LGBTQ Community, offering a month's worth of contemplative spiritual adventures to enhance confidence and tranquility while inspiring self-acceptance, love, peace, pride, and dignity. Edited by Kris Jacen, the book explains the process of focused attention known as meditation and it offers a simple relaxation technique to induce a meditative state of mind. Editor's Note for eBook readers: For those that do look at page counts between print and ebook files, there is a big discrepancy between the print and ebook editions of this journal in PDF format. Don't worry, you are not missing any content. The difference is that the print version of the book contains space to note several months observations for each meditation.